He may be living on the cutting edge of the lavish, eco-friendly homes movement, but he’s hardly the first on his block to enjoy the lifestyle. All of his neighbors live within by energy-efficient, insulated panel systems and photovoltaic solar panels for affordable heating and cooling. he butterfly and folded-plate roof lines and open floor plans popular in the Alexander homes have been updated in these six new homes, which feature larger rooms, 15-foot ceilings, gourmet kitchens, and a smart control irrigation system. These homes on Royal Palm Court also received a blast of glamour: Six interior designers were charged with creating luxurious interiors worthy of the $1.8 million price tags. Lighting by George Kovacs suddenly shone down on the terrazzo tile embedded with bits of recycled glass and the concrete floors were polished to a glossy shine. Furnishings from local stores — Classic Chic, Mitchell Gold + Bob Williams, P.A.D., Ligne Roset, and the new-to-Palm Springs Interior Illusions — were brought in by the truckload before the homes welcomed their first visitors last March. Several designers jumped at the chance to track down the finest in eco-friendly furnishings to take the mission one step further. Lori Dennis of Dennis Design Group in Beverly Hills relied heavily on Livingreen in Culver City for art, accessories, linens, and bedding made of organic or recycled materials in the model home she designed. “The coolest thing about green building is that you can reside in a home that is less toxic to you and the environment and actu- ally save money on energy while doing it,” Dennis says. Contempo estimates these homes will see electric bills that are 70 to 80 percent less than comparably sized homes nearby. im Clark of Wright Design in Palm Springs agrees that style never needs to be sacrificed in order to be environmentally sound. And for designers, “green building can actually enhance an aesthetic because it helps to activate the creative process,” Clark says. With eco-technology advancing quickly, Nichols feels strongly that there is no reason not to engage in some green aspect of building on any new project, commercial or residential. Although green interior design is a different beast. “While the market is introducing many new eco-friendly floor coverings, wall coverings, paints, and upholstery suitable for commercial interior design, the variety of products that are refined enough for personal interiors is still evolving,” he says. 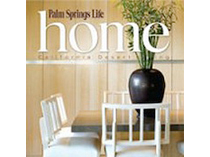 Contempo Homes has three more Palm Springs communities on the drawing board: Country Club Estates, Vista Estates, and Alexander Village. The first two should have models ready by late this year or early next year. Buyers can look forward to living across the street from like-minded individuals with their feet planted in the modern design of the present and a bright green eye toward the future.